Just Jingle: Everyday is an Adventure When You Are an Artiste! 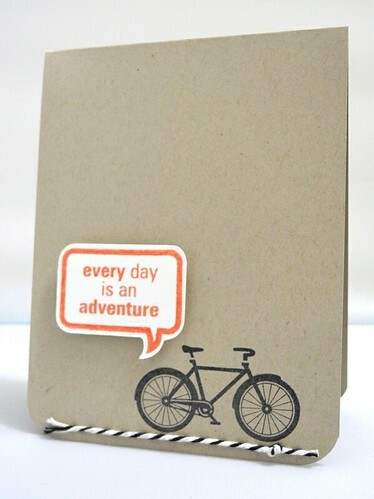 Everyday is an Adventure When You Are an Artiste! Guess what I got???!!!! The new Artiste Cricut Cartridge from Close To My Heart!!!! I know. Super excited about it. Did you see what I did with the title, there.... used the sentiment on my card and the name of the cartridge. Yup. Totally did that. Just sayin'. HAHAHA! Well, obviously it's Friday, which may have been easily assessed by my far-too-jubilant mood. I'm pretty happy about that, though. Not gonna lie! AND...tomorrow is another fun day out and about with The Hubbums, so THAT makes me super happy because those are always the very best days! Now...let's discuss this Artiste Cartridge. First of all, it's completely and totally awesome! I purchased it from Miriam Prantner, a WONDERFUL CTMH consultant. AND...she is offering an awesome deal that I totally need to tell you about. But first, check it! How much do I LOVE these stamps and the cuts from the cartridge that go with them! Just LOOK at that perfect little speech bubble combo!!! *LOVE!!! * AND...this cartridge has a ton of awesome 3-D stuff like boxes and envelopes, and amazing overall adorableness!!!! So. Here's the thing. The Artiste Cartridge comes with THREE coordinating D-sized stamp sets AND three coordinating chipboard shapes sheets. BUT...the stamp set I used here is NOT one of those sets! Whatever shall you do????? WELL....it just so happens that if you place your CTMH order before the end of September, you get an additional DOUBLE sized stamp set celebrating National Stamping month for only $5!!! Your order must be at least $35, but that's easy! AND...if you buy the Artiste cartridge from Miriam, she is offering you that extra set at NO COST TO YOU! Yup. She's giving it to you FOR FREE with your Artiste purchase! AWESOME DEAL! In order to take advantage of that, you have to email Miriam with your order at mprantner@gmail.com. Seriously. I LOVE my Art Philosophy Cartridge (the first one from CTMH) and now Artiste is taking a strong place right beside that one as my favorite! These are the single most useful cartridges I have ever purchased for my Cricut! They ROCK! AND...even better, when you purchase CTMH products you are supporting a family. And that's always awesome. Just sayin'. Great card!! Love the simple yet awesome use of twine! Love your card, so simple but yet so stylish. 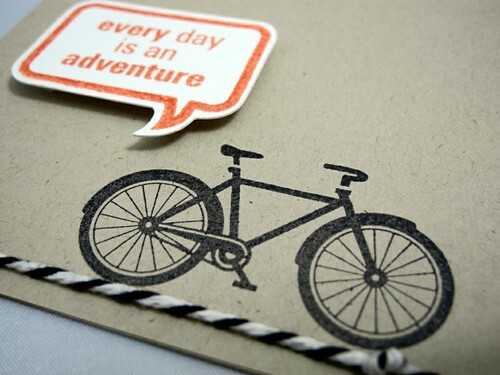 sweet card, make me want to dust off my bike! Very smart post name...hehehe!!! Super cool card too...my cricut needs more love!!! This is just a cool CAS card. Congrats on the new toys! I don't have a Cricut but this card turned out great. Love the CAS design and the pop of orange! That twine is a simple touch but makes it so special - wonderful. Simple yet cute card! They are indeed a very lovely share. Amazing page! My Final Card as Sweet 'n Sassy Guest Designer! Skeletons, Ghosts, and Bats! Oh, MY! Stampendous! Holiday Gift Blog Hop Time! Fall Frenzy Blog Hop with Sweet n' Sassy Stamps! Simon Says We're So Trendy! Simon Says It's STAMPTEMBER Blog Hop Time! Let's Spice Things Up a Bit, eh?